If you want to encourage me to maintain Smartfeed, please consider sending me a small donation. 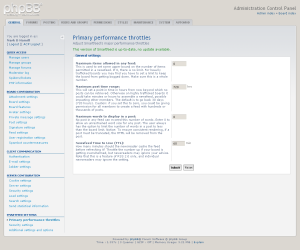 The mod does not work with versions 3.1 or greater of phpBB. The extension does not work with versions 2.0 or 3.0. 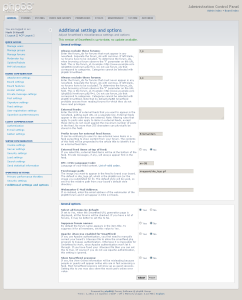 Provides RSS 1.0, RSS 2.0, Atom 1.0 customized newsfeeds for phpBB forums. 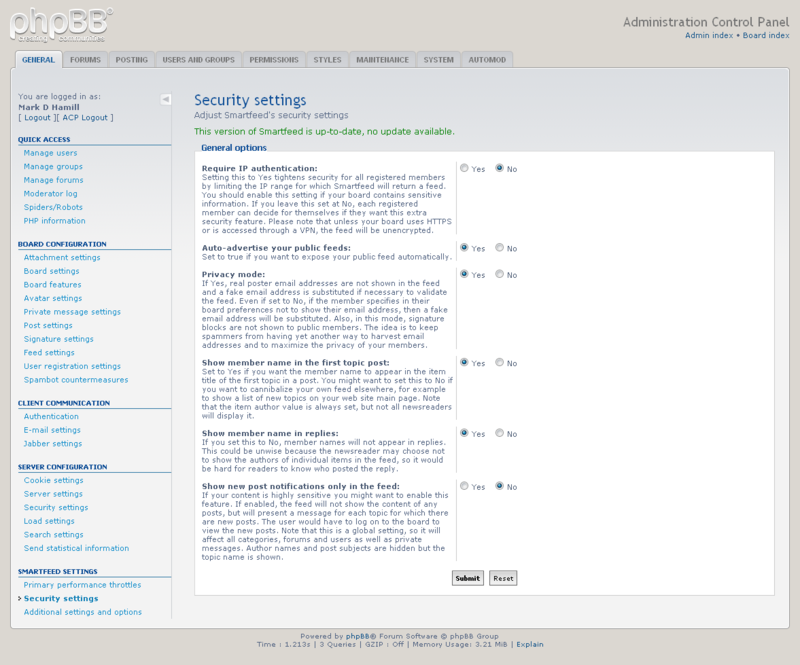 Users select forums they want, including protected forums if they can access them. Administrators can incorporate external news sources (if available as a feed) into their feeds. Note: As of phpBB 3.0.6, phpBB has a basic Atom 1.0 newsfeed feature. If your needs are simple, this may be all that you need. You might want to read phpBB’s Atom FAQ. If you need authenticated access, have complex needs for the content of your feeds, or need RSS 1.0 or RSS 2.0 feeds for your board, Smartfeed is the mod or extension of choice. It will not conflict with the new Atom Feed feature in phpBB. 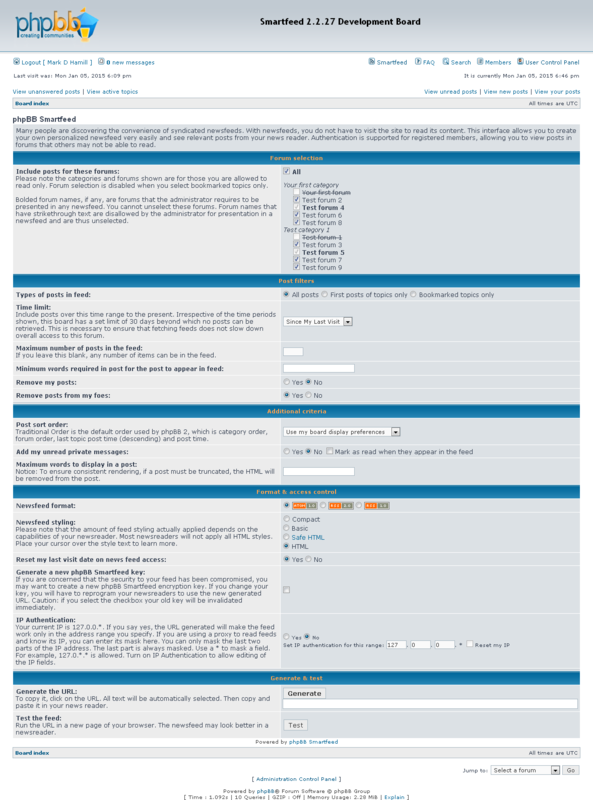 phpBB forums may contain restricted forums that should not normally be exposed as a feed. 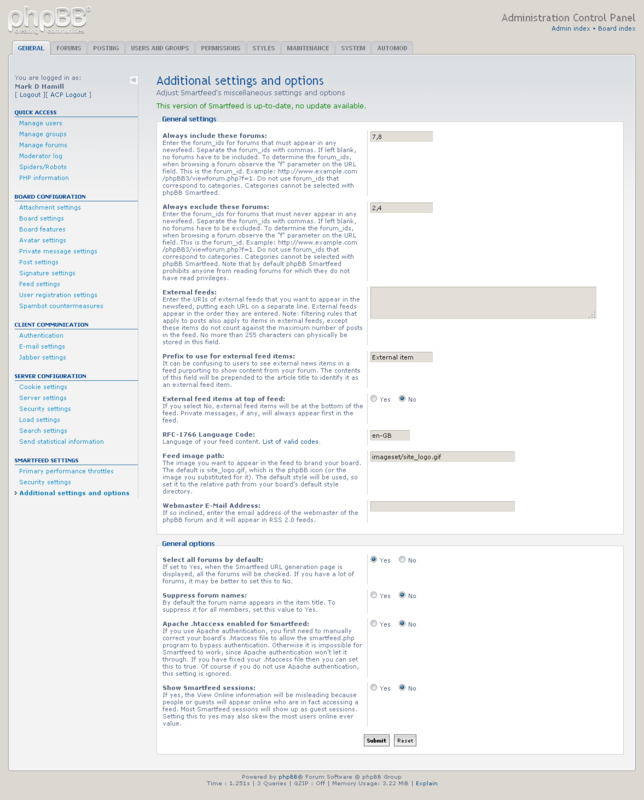 Smartfeed is a phpBB extension and modification that allows users to get a newsfeed for selected forums, including restricted forums if they have the privilege. This is done by using an interface program that appears on the navigation bar after installation. Smartfeed is smart enough to keep users out of forums for which they do not have access, even if they hack parameters on the URL field. Authentication is handled via a URL key/value parameter that encrypts the user’s password hash in the database. Those who are not registered can access in the newsfeed only those forums that can be read by the public. The URL generated is then copied and pasted by the user into a newsreader. RSS 1.0, RSS 2.0 and ATOM 1.0 newsfeeds are supported. ATOM 1.0 is the default for the extension. RSS 2.0 is the default for the modification. External feeds are integrated using the PHP SimplePie library, which is integrated into both the modification and extension. This has been tested, but not extensively, by validating reasonably complex feeds for RSS 1.0, RSS 2.0 and ATOM 1.0 at http://validator.w3.org/feed/. It has been tested on a MySQL 5.0 environment only but should be DBAL compliant. Installation is generally simple. 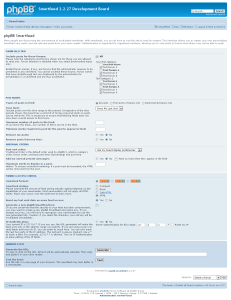 As an extension, Smartfeed is installed using phpBB’s extension installation process. 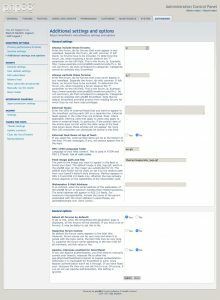 If downloaded as a modification, complete instructions for installing phpBB Smartfeed are included in the archive by opening the install.xml file in the browser. If you prefer to have me install it for you professionally, see my services page. Release notes and discussion are on the Smartfeed extension’s discussion area. 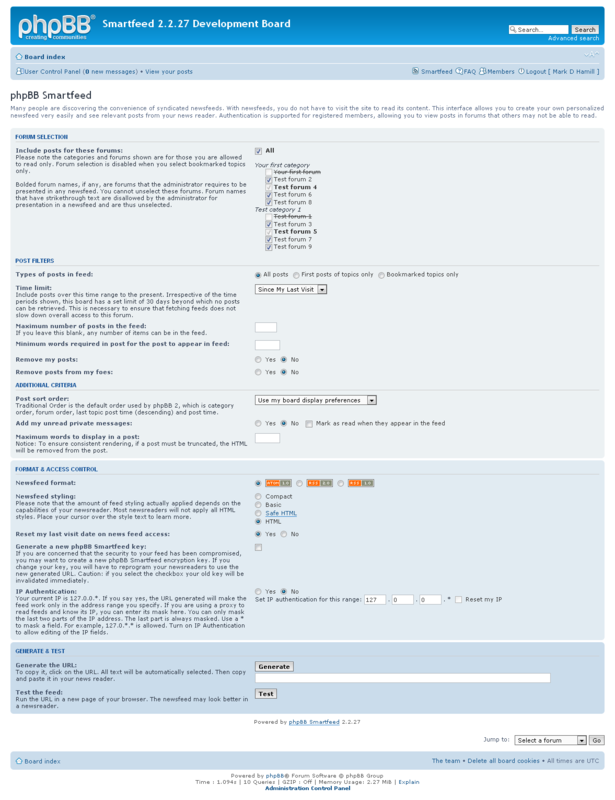 3.0.8 – Approved version available on phpbb.com. 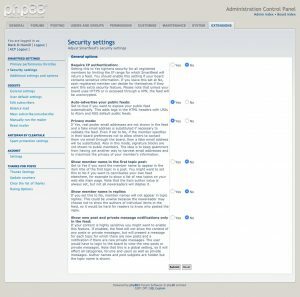 Supports phpBB 3.2 only (June 22, 2017) – uses a better encryption algorithm. New URLs are needed to retrieve a feed. 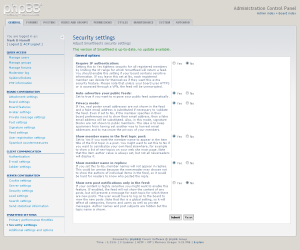 3.0.7 – Supports phpBB 3.1 and 3.2 (May 20, 2017) – openssl is now used instead of mcrypt. New URLs may be needed to retrieve a feed. If you have a translation, please let me know. Make sure to place it on GitHub! You cannot hide Smartfeed sessions. In most cases Smartfeed sessions will show up as guest sessions. You cannot specify a proxy IP. If you want to use the IP authentication feature, it will apply only to your IP at the time you generated the URI. If your IP changes you will have to regenerate the URI using the Smartfeed user interface. You cannot generate a new Smartfeed key. 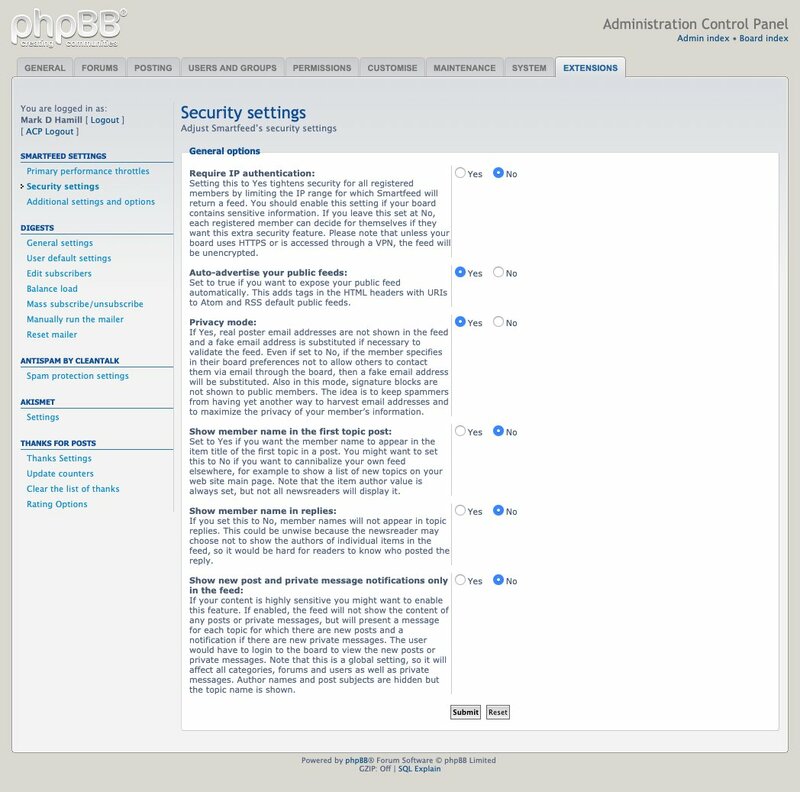 You lose the ability to see protected forums if openssl is not compiled into PHP. Fortunately, it usually is compiled into PHP so it’s probably not a concern. As a result the PHP Secure Communications library is not part of the extension. The feedcreator class is no longer used. 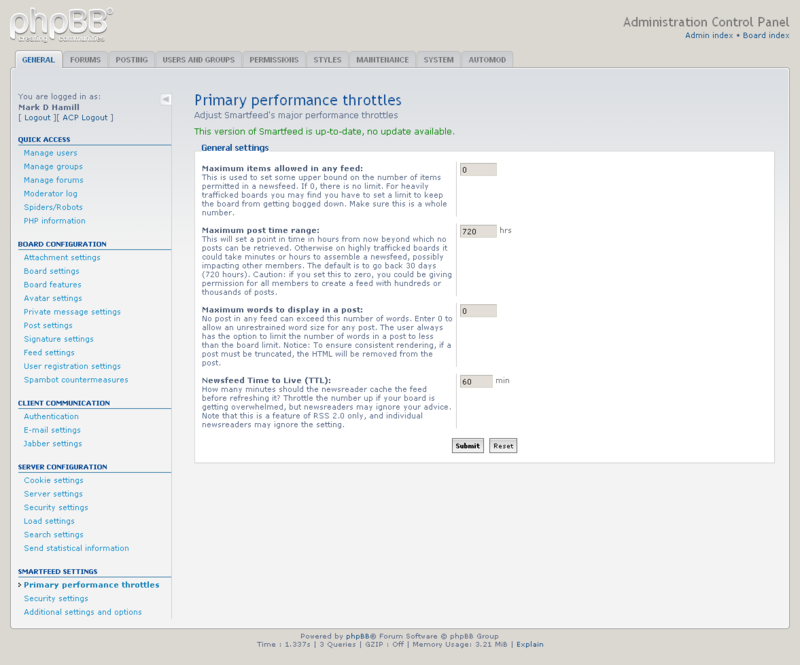 Instead, phpBB’s template engine is used to generate feeds. The URL for the feed has changed due to the extensions architecture. Previously it was http://www.yoursite.com/yourforum/smartfeed.php. Now it is http://www.yoursite.com/yourforum/app.php/smartfeed/feed. Similarly the URL generator program was http://www.yoursite.com/yourforum/smartfeed_url.php and is now http://www.yoursite.com/yourforum/app.php/smartfeed/ui. Consequently, users will have to generate a new URI to use the Smartfeed extension. // These constants are used to identify URI key/value pair associations. 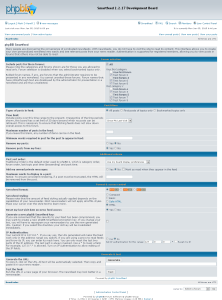 Note these have changed since the phpBB 3.0 mod so URIs will be shorter. 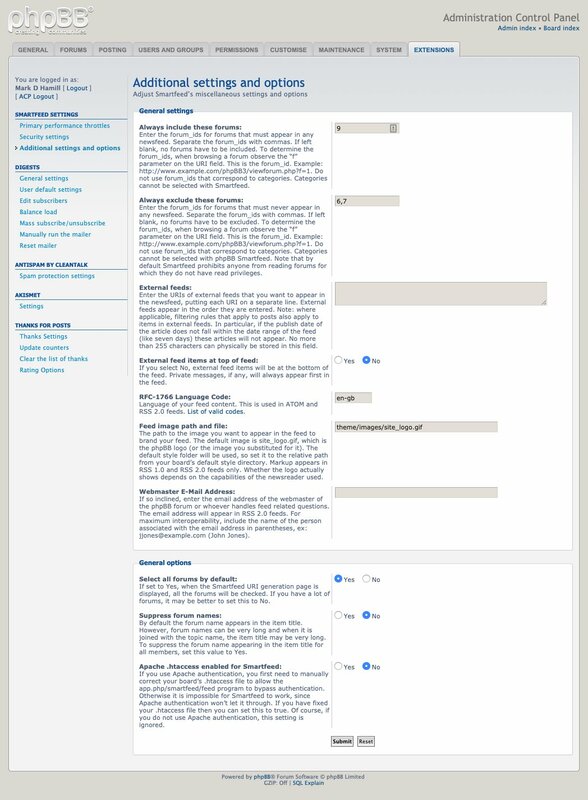 Click on the images to tour the User Control Panel and Administration Control Panel for the Smartfeed extension. 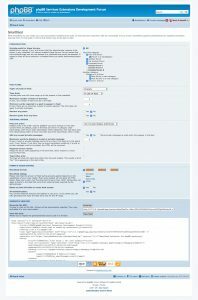 As of August 2009, a phpBB approved mod is available. I don’t actively support the modification anymore since phpBB has evolved to use extensions instead. I sporadically read the old support topic. You may wish to leave questions there. 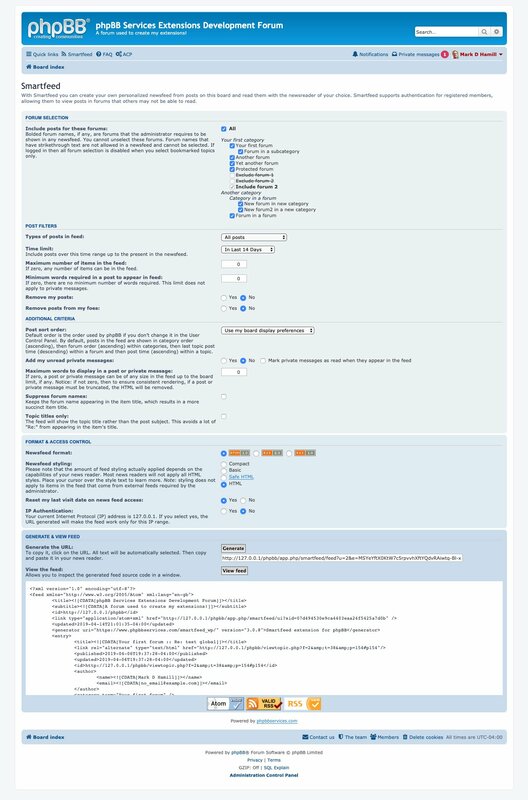 No new versions of the modification for phpBB 3.0 will be produced. No further work will be done on these versions. If you want paid support, send me an inquiry. You have to edit your .htaccess file to allow app.php/feed and bypass a .htpasswd file. In addition there is an ACP setting for Smartfeed where you have to enable its use for HTTP authentication. Any chance to make it work with http-auth? I would like to use is in thunderbird, but all my forums are private and will only display anything after successful http-auth.